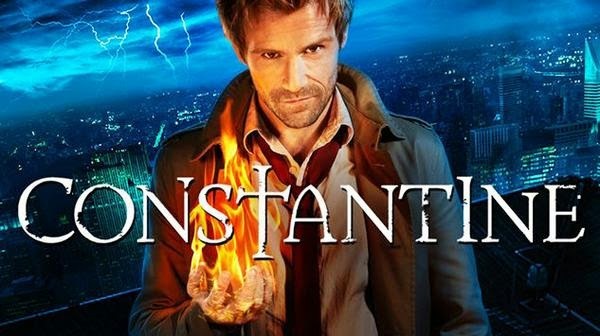 To John Constantine and Chas – with Chas following John’s magic to make money gambling. John has heard about the burning in Pennsylvania and, more importantly, the map that Liv left last week has a wet blood spot over the town. Alas, Chas can’t go because of a little train derailment. We cut to a woman drawing lots of pictures of John and angrily asking “who are you”. Her room has pictures not just of him, but several demonic pictures as well. She leave and runs into John who is watching the funeral. She’s stunned to see him (much to his bemusement) and says she’s dreamt about him and he sees she has a picture of him. He assumes she’s conning him (or pretends to) and tries to leave but she begs him to explain – he distracts her and disappears. But he’s not as quick as he thinks he is, she has stolen his wallet and pulls out his driving license. Wake time, everyone bringing food (John brought a ready meal) and naturally sneaks into the family only section of the bun-fight (can’t say I’ve ever seen one of those signs at a wake before), there he finds the sooty handprint and the much sootier shower. He takes a sample of the black goop in the shower head. He has a brief interview with the widow who dodges the question of hearing anything knocking in the mines but does offer a story of a Romani girl marrying a “captain of industry”, that industry being coal. John ignores this surprisingly odd hint and tries to leave, especially when the widow starts playing with his tie and suggesting she’s free to… talk. She chases him out and has the crowd catch him for being a reporter, but the big guy in charge seems more suspicious, though possibly for the Environmental Protection Agency. After a brief fight, John confronts him about an “unnatural disaster” in the mine (though is confused as to why it got out) and the boss is worried about scaring his miners; he refuses to answer when John talks about the knocking. John returns to his hotel and runs into the artist, Zed (they both stole each other’s information). She has visions and dreams and wants answers – John not so much. As she tries to get her to leave she grabs him and reads his emotions – which are all sad and guilty. This prompts John to help her find some answers (and him) using her psychic powers to check out the black sludge he collected. Which ends up with her having horrific visions of burning but also lets her see a tall cross. He suggests they’ll work together solving the mystery – but instead leaves without her. Zed goes to the bar and talks to the ex-pastor who lost his son and talks vaguely about faith and the cursed mine before she goes home to find John in her flat waiting for her (sleeping on her sofa). She starts to kick him out but he insists he was just checking out her abilities before telling her more – and admits his profession. John has a big big dramatic speech about the terrible things he faces. She’s not scared off and the showndown is interrupted by a siren – there’s been a mine collapse. He goes to the mine and confirms the miners heard knocking before the collapse. John decides to confront some guy (boss man’s son) in his car about digging into the earth “where no mortal man has a place”. He tells him to shut down the mine – as the car locks itself and begins to fill with water. Water which has clawed hands in it to drag them under. Zed saves them by arriving in time and prying open the door. John lives, the other guy doesn’t. Walking back, John expositions to Zed – coblynau, which warn miners of danger. Only they don’t normally kill and never come above ground. Something is messing with them, drawing them out. They go to the bar where there’s a big meeting of the miners and they put some clues together about Ellis, the ex-pastor. John talks her through another vision and reveals the location of Ellis at a camp – so it’s field trip time. John tries some exorcism on the pastor which doesn’t work because he’s not the bad guy. He points out what John and Zed missed; the people dying above ground aren’t miners, they’re bosses. Last boss is someone called Tad and he and his son are opening up the mine and checking to see if it has been cleared before the miners return. John and Zed arrive in time to see a coblynau leap out of the gravel covered ground, knock the boy aside and grab Tad by the throat. Zed paints a symbol that John directs on the wall while he respectfully honours the coblynau, reminding the coblynau of what it is; a guardian, helper, protector. Tad is dead though. John again says they have to close the mine and ensure no-one else goes down. Which leads to him, Zed and Ellis outside the mine, setting off explosives inside to close it down. The coblynau are now at rest if left alone – but doesn’t mean that whoever summoned them and made them kill isn’t still out there. Back to John and Zed snarking, John trying to convince Zed to leave him to do his work alone. She’s not buying that, I suspect this argument will be revisited. It was doing so well – and then Romani curses? “Nothing blacker than gypsy magic”? Really? Romani are constantly depicted as being either thieves or mystical – and to compound that by taking the eternal “mystical romani” trope and then making their magic extra, specially black is further demonising a people who are constantly demonised. Was there any need at all? Couldn’t she have been any kind of black magic practitioner and had the coal mark be sufficient evidence to point to her? And I’m impressed at a pretty obscure myth being used – it’s nice to see some research. I generally like John in most ways (he’s one of the few characters who can pull off that jaded, run down bad boy) and I think Zed will be a much more interesting character than Liv. The pacing also felt incredibly slow – John didn’t seem to be getting anywhere or actually doing anything. Generally I hate the whole “I work alone to keep you safe” schtick, especially from a man to a woman because it has so much paternalism to it. In this case it hasn’t bothered me too much because it seems less like John ensuring Zed is kept safe and more of him ensuring she knows exactly what she’s getting into – and keeping himself safe should she not be who she claims to be.